Secure your place on the Map today! Enhanced Web profile, Event Calendar listings, Featured web category placement, Press Releases, Banner ad campaigns, MORE! The 2019-2020 campaign will celebrate the LOOP's 10th Anniversary, and it promises to be bigger and better than ever! But space is limited to first-come-first-serve and it closes soon. Don’t delay – sign-up today! Interested in easy annual or monthly payment plans? Sign-up here. The upcoming Culinary Adventure Map will once again be widely distributed, featuring expanded Pathways to the Peninsula and featured distribution such as last years insert in the Spring 2018 issue of Edible Seattle Magazine! Sign-up today to insure your place on the map and in front of hundreds of thousands hungry Taste Tourist, Travel Writers and customers! Back by popular demand – “Go-Do-Dine-Stay” County-by-County appetizing itineraries! Enhanced map listings – Help your business stand out with highlights or even inclusion of your full-color logo! Year-round Culinary Festival Listing – 12-months of featured Olympic Peninsula food festivals assures that the Map will be retained and referenced all year long! Miles of Press – Travel Writers love the LOOP! Thanks to aggressive FAM tours members on the Culinary Adventure Map have been featured in dozens of popular publications, with MORE planned! The value of partnering in print placement! Having our map featured, as an insert, such as the Pac NW Edible Publications, instantly invites the Olympic Culinary Loop to an audience of over 300,000 readers! With costly print display ad rates your business promoted through the Culinary LOOP just became the smartest business decision you’ll make all year! sample (appetizer) itineraries Industry Members are entered into a drawing for placement. Corporate Members are GUARANTEED featured Itinerary placement! Get your place on the map Today! Renew or join Olympic Culinary Loop today! 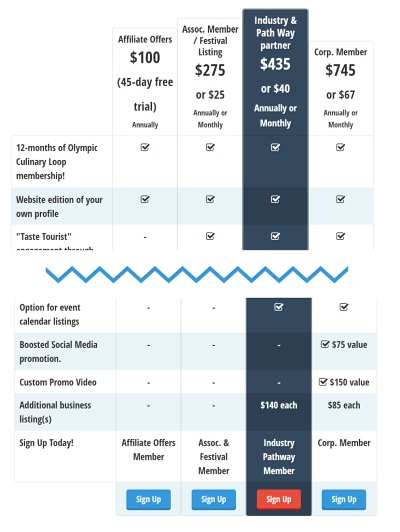 Interested in easy annual or monthly membership payment plans? Sign-up here.